Show Builder. Show Builder is a visual production tool designed to allow users who are not familiar with scripting in Digistar to create real-time shows for the dome. Using Show Builder, the user creates a scene on the dome, takes a snapshot, then modifies the scene, taking snapshot after snapshot. These snapshots assemble side-by-side on a visual timeline or “storyboard.” Users can easily adjust snapshot durations and transition times using the time duration controls below the snapshots. When played, scenes transition gracefully. The user may also add a script or fulldome video to the storyboard by dragging the item from the library to the desired position on the timeline. Show Builder projects may be exported as scripts for sharing or use in the Digistar Library. Users can edit, modify, delete, or add scenes at any time. Hi-Res Planetary Surfaces. 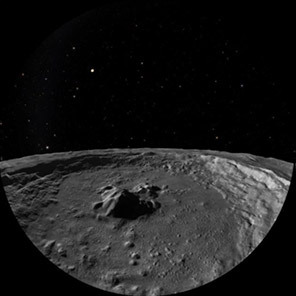 Digistar's new terrain feature automatically transitions planet models to high-detail terrain models when nearing the surface of the Earth, the Moon, and Mars, without textures paging or tiling onto the model. In addition, any number of high-detail texture images can be downloaded from within the UI and displayed for virtually any named location on Earth. A View Terrain location button navigates you to the selected location. 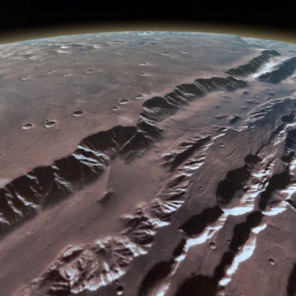 Our high resolution terrain elevation and photographic texture maps for the Moon and Mars come from the very best sources available, to provide the very best and most up-to-date information. Fly over the Alps or over the city planetarium. Orbit around the Moon to simulate views seen by the first Apollo astronauts. AMNH Digital universe. Since 1998, the American Museum of Natural History and the Hayden Planetarium have engaged in three-dimensional mapping of the universe. This cosmic cartography brings a new perspective to our place in the universe and will redefine your sense of home. The digital universe is not an add-on or extra tool, but fully integrated into Digistar. STEAM. STEAM stands for science, technology, engineering, art, and mathematics. The new Digistar STEAM library contains a growing collection of content with a suite of control panel pages for interactively exploring the scenarios in detail. 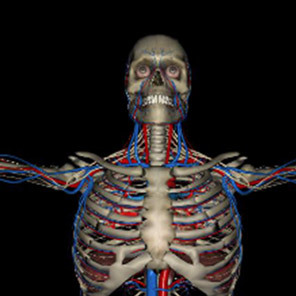 Access also several sets of 3D, high-quality models of the Human Body, Parts of the Human Body, Biology, Viruses and Bacteria, and more, including a set of Hominids skulls. 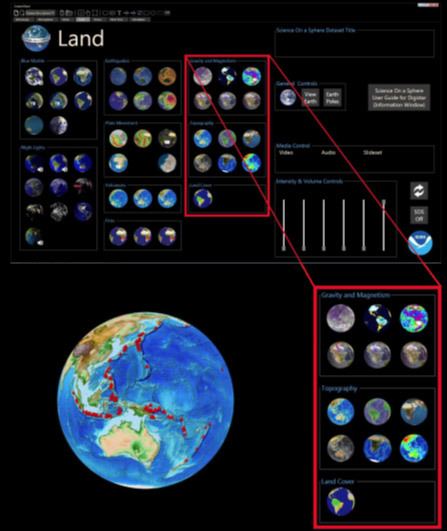 The set includes the new NOAA View dataset. Solar Dynamic Observatory. 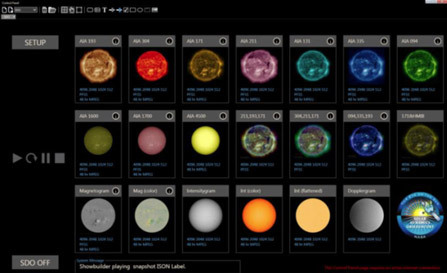 Digistar can show the sun in a variety of layers and textures in the Solar Dynamics Observatories (SDO) control panel window. Users can display various textures, images, and videos in several different wavelengths directly to the 3D model of the Sun. The control panel can be connected to the Internet for real-time, dynamic updates. Digistar Cloud. Digistar has an optional “always-on” connection to a cloud library where users can share videos, audio, models, images, or other great content with the Digistar community. Digistar users can choose to upload content with the click of a button. 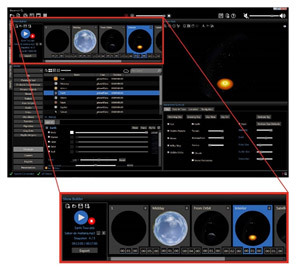 Digistar automatically searches the local Digistar system to find all elements needed for a scene, and packages them together into one file for convenient upload to the Digistar Cloud Library. Content stored in the Cloud displays automatically and users can search by name, tags, content creator, file type, etc., to easily find useful content. Users can download content with a single click. Digistar automatically adds the content to all PCs on the local Digistar system for immediate display on the dome. Domecasting. Domecasting enables Digistar 6 theaters to schedule and broadcast live dome presentations to other D6 theaters in the community. Domecast schedules show up in the Digistar user interface, so that other theaters can tune-in to live presentations and experience them simultaneously. For example, in a Digistar theater or from a Digistar workstation anywhere in the world with an Internet connection, a well-known scientist or personality can give a live presentation, and dozens of theaters can watch and interact with the Domecast as it is happening. Domecasting upgrades requires the Cloud upgrade to work properly. 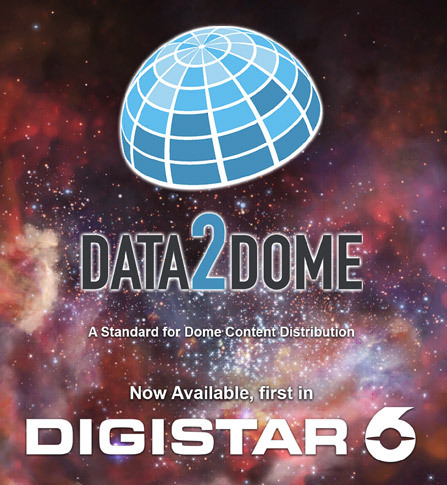 Data2Dome (included with Digistar Cloud) Purchasing the optional Digistar Cloud, the User will be able to access the new Data2Dome library. Announcement from ESO: ESO is proud to publicly launch a running version of the cutting-edge Data2Dome project in partnership with Evans & Sutherland and the International Planetarium Society . This exciting new free system for planetariums delivers the complete collection of images and videos from ESO's frontline telescopes at La Silla and Paranal, as well as from ALMA, ESA/Hubble — and through NASA’s and IPAC’s Astropix project: NASA’s Spitzer Space Telescope, Chandra X-Ray Observatory, GALEX, WISE, and NuStar, as well as ESA’s Planck and Herschel space telescopes. Data2Dome also delivers stunning fulldome images and videos, 3D models and music, as well as the latest press releases and blogs from all astronomy and space organisations worldwide, all at the click of a mouse — and for free! Data2Dome’s AstroCalendar module provides daily feeds of significant astronomical events such as spacecraft launches, planetary alignments, historical anniversaries and more. Astronomy is a dynamic discipline, with spectacular discoveries, images, videos and other data published every single day. Planetariums around the world have always wanted to share these new developments, but it often takes days or weeks to transform the latest news into planetarium content. The vision of the Data2Dome system is to seamlessly integrate astronomy data into planetarium systems in almost real time, allowing planetariums to immerse their visitors in the latest discoveries the day they are announced. The database is carefully curated to include high-quality material and to save presenters’ time. Every morning, planetarium presenters can access interesting news and fresh datasets, and download them — for free — to use in shows throughout the day. Presenters can report on events as they take place, or incorporate a segment of “Last week in astronomy” into their programme. This streamlined flow of information will transform planetariums into dynamic venues that are always up to speed, bringing the science of astronomy to life under the dome. Data2Dome is now available to many planetariums worldwide using Evans & Sutherland’s Digistar system. If you are a presenter using the Digistar 6 system in your planetarium, open the Data2Dome tab to make use of these free resources right now.